Puget Sound students, staff, and faculty may watch the conference plenaries/keynotes via live stream. Must use university credentials to access. We look forward to this space and time together, learning with you and our local and broader communities, right here on the Puget Sound Campus! · RPNC 2018 will be the Puget Sound Classroom on Friday September 28th! We want you to be able to fully engage with the conference. We have several resources for you all prior to the conference to assist in your preparation. Much appreciation goes to all the staff, faculty, and students whose work, ideas, and time has supported the conference!!! · Campus Members please register here. Your University ID Badge will be your "ticket" to enter conference sessions. · View the conference Program and Schedule here. · There are many events and resources to prepare campus members for the conference. 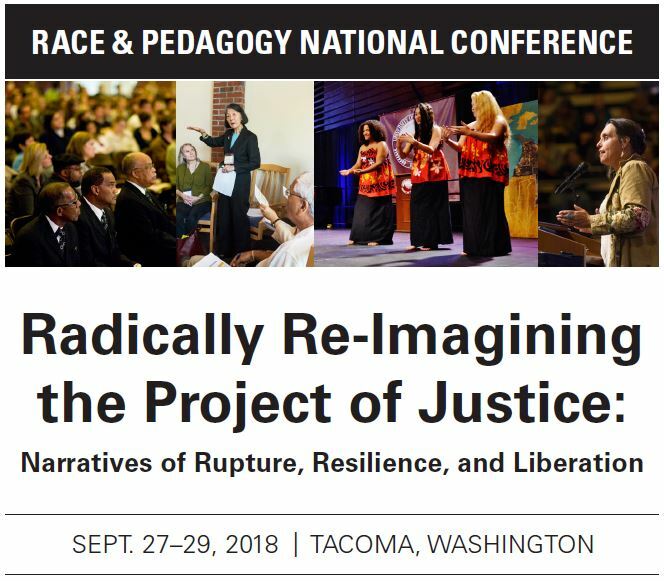 The Race & Pedagogy National Conference includes 4 Keynote Sessions, 12 Spotlight Sessions, 120 Concurrent Sessions, and 10+ artistic and interactive performances, exhibits, and conversation opportunities. Seating for most events will be on a first arrival basis, and on the registration form you can enter a lottery to get tickets for evening arts events.